How about that weather? From above freezing and raining and melting and zooming back in the space of a day to so cold it hurts. Jeez - if you don't like the weather, wait ten minutes! The loot from Tucson has arrived (no, Marg does NOT lug it back in her suitcase!). There is a small mountain of boxes for me to sort through, shoot, prep, price and add to the website - I'm sure you'd all love to come and rummage through my studio. At a quick glance, there will be pearls, stone beads, and some more of that lovely, distinctive vintage-looking glass - who knows what surprises lurk, awaiting us? Only Marg knows, and she ain't telling no one! First up, we will have some of these very ethnicky stone beads, coming at ya next week. After that, well, we'll just have to see! The flu bug has hit us really hard this week. We've been down 4 people most of the week, but everyone is slowly on the mend. Thank goodness I've been pretty healthy this week. I've been so busy this week, that I don't really have anything particularly beady to talk about today. I have been training pretty hard for my upcoming walk (in September) But hey....It's 60k, and I've got to start now. I've come across a few blogs for any of you healthy foodies out there. My favourite is Dani Spies. She's got all kinds of recipes and 101 videos for wholefood eating. I've managed to convert my whole family to an 'eat-clean' diet. What that means is cutting out all of the processed junk. So far, it's going over really well, and the kids keep checking with me to make sure that the food I give them is 'healthy' :-) Gotta love it! My favourite recipe this week came from the Eat Clean Cookbook by fellow Torontonian Tosca Reno. It the most incredible version of couscous I've ever had....And I love couscous anyway. Recipe from "The eat-clean Diet"
over dressing. Mix in oregano and season with salt & pepper. anyway...Happy weekend all! It's my birthday weekend, and I'm going to have cake...chocolate cake....so not on my eat clean plan ;-) Back to our regularly schededuled beady talk tomorrow! A few of you have started emailing, and coming in asking if we are participating in the Corsage Project this year. We are! I'm just working out the details for this year, but will in essence stay the same as last year. Here is a link to last years info - the only thing that may change is the deadline. We are also planning a special all day open beading event (on a weekend) for all of you to come in and work as a group on your donation submissions. More details to come soon! To provide formal gowns and accessories, free of charge, to Toronto area high school girls who are unable to purchase their own prom attire. The Corsage Project was founded in 1999 as a nonprofit organization that works in partnership with the Children's Aid Foundation. The founders believe that every high school girl should have the opportunity to celebrate the milestone of her high school graduation with pride and in style. Students are identified through confidential referrals from school guidance counselors, Children's Aid, youth, or social workers. Girls who are referred are formally invited to attend a 'Boutique Ball' in May where, assisted by a personal shopper, they select a gown of their choice, and shoes and accessories to match. This special day includes a make-up and hair consultation, a professional portrait, refreshments, and goodie bags. Thanks to the dedication of our team, volunteers, community & corporate sponsors, we are now able to help over 200 girls. We only have a few days left in February and what a great way to end off the month with Nadine Foskin's Dancing Dahlia class on Saturday February 28th from 10-1. There are a couple of spaces left in this class--I would book now! 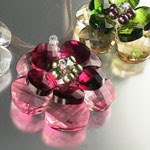 Saturday March 7th and Sunday March 8th we have a Glass Bead Making Weekend with Amy Waldman-Smith. Nadine's beautiful Wild Flower Pendant on Saturday March 7th. 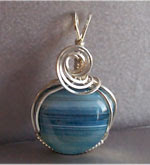 Wire Wrapping 201 with Robert Burton begins on Monday March 2nd. This class usually fills quickly, early registration is recommended. We also have a great Metal Clay weekend coming up. March 21st and 22nd with Heather and Jennifer. This is an Introduction Intensive weekend, open to all levels. March 24th is 4 hour Lampworking Introduction course with Dwyn Tomlinson. Metal Smithing 101 begins again on Wednesday March 25th. This is a great introduction to metal smithing, it runs for 8 week. And this is just part of the month!! Keep checking for more exciting classes. Spring classes will be going up over the next few weeks so keep an eye open! A flu bug has hit us pretty hard this week. We're down 4 people, and of course the person who designed our inspiration this week has been sick too! Malliga is sending me the list later tonight. As soon as I have it, I'll update today's inspiration. On another note, we had a metal clay play day today - Thats why my blog posting is so late. We had a nice big group today, and everyone was so productive. I managed to make about 6 pendants, finished 2 boxes, and I'm starting on my third. I'll be adding these to our "Buy a Bead For Breast Cancer Basket" once they're done. 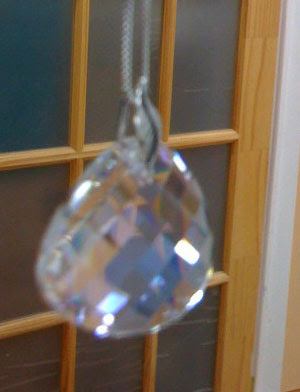 Have you noticed how beautifully the 6 and 8 mm Swarovski Crystalized Elements - Top Drilled Bicones fit together? String these side by side, alternating sizes, and you have instant drama. You can alternate colours, or go with a solid colour. Let me tell you - these beads, in a bracelet, all Crystal or Crystal AB! Knocks your eyeballs out. They pack close - the firey bracelet - which is, admittedly, sized large, has 41 x 6 mm, and 40 x 8 mm. Boucheron has been making jewelry for a long time - but they have some surprisingly playful ideas. And they sure aren't afraid of colour! Check out their "design it yourself" section - where you can choose to put rubies, diamonds, sapphires or emeralds on the jeweled chameleon. And then check out the "High Jewelry" section - especially if you believe in tight deadlines (watch the video!). Site navigation can be a little odd - but just wander around and look at all the pretty baubles. It's Stone of the Month time again!!!!!! This month is Pietersite. Beads with sizzly streaks of goldstone too! Beaadwork.About.Com is hiring a beadwork guide. For more details, check out this link. We're looking for an experienced beader who is capable of communicating that knowledge to a less experienced audience in terms that are easy to understand. Ideally, we'd love to find someone who creates original patterns and projects, but is able to demonstrate/teach classic patterns and techniques as well. Preferably, this person will be a published author or have experience teaching this skill to others. Basic knowledge of HTML is required. The primary audience for About Beadwork is the beginner beader. The site should cater to those who have no experience with this hobby and have an interest in learning. Content for these users will include step-by-step tutorials, a glossary of terms, and easy projects for beginners. Content should include tutorials, a glossary, projects for beginners, recommendations/reviews of tools, patterns and helpful tips. We would like to see step-by-steps and how tos of various techniques. When you use beadwork terminology, link to your definition that you've created in the glossary. Here's a rough outline of what should be covered on the site. This is not comprehensive. - All patterns should be your original design, public domain or used with permission (and cited appropriately). Make sure to have many patterns that are targeted at all levels of experience. - Patterns should be organized logically, i.e. by skill level, seasonal, etc. - Reviews/Recommendations of books, magazines, contests, etc. In addition to a base payment (guaranteed to be $675 per month for Guides in their first two years, with a minimum of $500 per month afterwards), About.com pays Guides by measuring page view growth (month-over-month for Guides in their first year, and year-over-year every year after) with payment incentives for pageview growth. If your page views grow, you will never make less than $675 per month. Ahhhh, Spring. We need it to come soon. We've had some little glimpses of the sun here and there, and the days are finally starting to become noticeably longer. 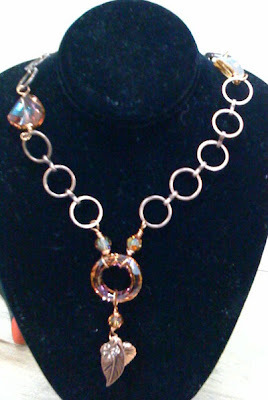 Our staff have been working on jewelry designs that have a definite spring feel. Just in case you haven't seen it yet, here's the Spring Colour Report from Pantone.
" Spring traditionally evokes a sense of freshness and new beginnings, with sprouting shoots and blossoming flowers that inspire designers to breakout of the winter doldrums. Bright colors return to the top 10 list for spring ’09, as designers incorporate vibrant pops into their collections, yet temper the vibrancy with deeper, translucent or neutral tones. “New York’s fashion designers encourage hopeful attitudes with lively colors, while sophisticated, grounded hues address the need for stability in times of economic uncertainty,” said Leatrice Eiseman, executive director of the Pantone Color Institute®." Join us on our Walk or Donate to the Cause! Proceeds benefit The Campbell Family Institute at The Princess Margaret, funding important breast cancer research, education, services and care. Jennifer and Marilyn will be participating in the weekend walk. Cancer has affected our family, friends, and customers. Please help us raise money for the Princess Margaret Hospital in their fight for a cure. Our Team page can be found here. From this page you can make a donation through either Jennifer or Marilyn's pages. Feel free to contact Jennifer for more information. I forgot to mention in my earlier blog post today that there is a Metal Clay Play Day on Tuesday February 24th from 11-6pm. Call and let us know you are coming please and thank you and hope to see you there!! Move over February, Make Room for March!! February has been an awesome month for classes so far and it's not over yet. We have a 5 hour Introduction to Glass Bead Making class with Amy Waldman-Smith on Sunday February 22nd from 11-4. 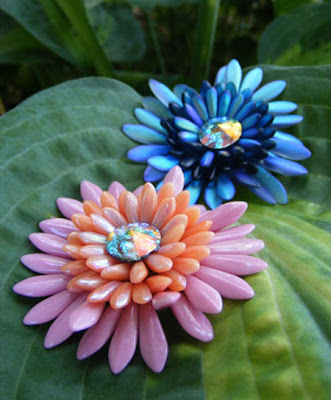 And of course we have the beautiful Dancing Dahlia Brooch with Nadine Foskin on Saturday February 28th! As great as February was, March is looking even better. 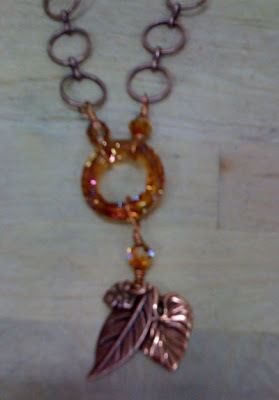 Sunday March 1st we have Robert Burton's Wire Wrapping 101 class. This class fills quickly so early registration is strongly recommended. Monday March 2nd is Wire Wrapping 201. This is an intermediate class ideal for those who want to continue with more complex wire work. Students should take the 101 first. Heather Bell-Denison's Charmed I'm Sure on March 3rd. 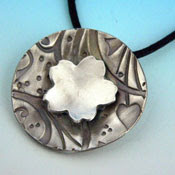 And Nadine Foskin's Wild Flower Pendant on Saturday March 7th. And that is just the first week!! Tune in next for more details on upcoming classes!! Saturday was quite the fun day in the store! (and busy) We had a full studio, two classes going on, and of course our little beading party! A few of us brought in batches of cupcakes, and we all ate way too much. Check out Cynthia's blog for pics! Itching to be a Rhinestone Cowgirl? Or maybe you want to add some sparkle to your scrapbooking? We suggest the Bejeweller(R) if you are setting individual rhinestones. We tried some of the cheaper stone setting devices and they just don't work as well. The Bejeweller comes with a variety of sizes of tips - for the different sizes of stones. The basic idea is that you pick the stone up with the cup in the tip - pause until you see the glue liquify, and put it in place. Essentially - these hot-fix stones have hot-melt glue, pre-applied, making the whole process of applying them waaaay easier. First lay a sheet of paper or teflon behind the fabric that is going to be covered. That will keep the glue from seeping through and getting on something else. (Like the table, the other side of the t-shirt, etc. After the pattern is finished, carefully turn the fabric over and lay it on a sheet of waxed paper or teflon. Put another sheet of paper or cloth on top of the fabric. Take an iron at the hottest setting, no steam, and place it over the pattern for about 10 seconds. Do not rub or move the iron on the fabric or you might dislodge the stones. This will ensure that the glue has completely set in place. Once the stones are set and the glue has completely cooled, the garment can be washed on the delicate cycle in your machine with no problems. We have even washed them (accidentally) in the regular cycle with no ill effects. Just make sure you turn the garment inside out before washing. These stones are used in garments such as skating costumes which take a lot of hard use without coming off. The stones themselves are labeled with the utterly confusing "ss" (stone size) labeling, and, to make it even more confusing - the sizes are more of a range than an exact measurement. Don't get me wrong - the rhinestones are all the same size, it's just that when you talk about ss 9 - it is defined as being 2.5 - 2.7 mm. 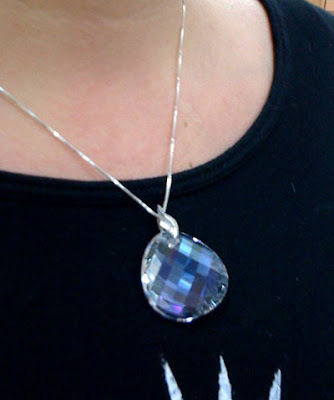 We have both the Swarovski Crystalized Hot Fix and the Preciosa. 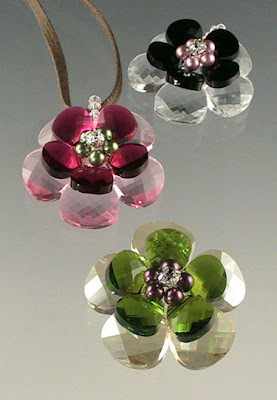 Swarovski announced their new colours for Spring 2009 this week. They are continuing their exploration of their opal series with Air Blue Opal. This blue opal looks remarkably like a vintage colour they had 30-40 years ago. What goes around, comes around, I guess. There's a lot of new shapes in the Fancy Stones (no holes) lines, but less so in the bead lines. There will be an oval shape to go along with the Cosmic Rings, Squares and Triangles and the donuts will now be available in 4mm, but not in all colours. We should be getting delivery of these in a couple of weeks, so look for them on our website soon! Well, here's a site that falls into the category of "where was this when I was getting my career started?" Course, there are lots of sites like that - and the reality is - there was no internet when I was getting my career started. This one is called 99 Designs and is a graphic design contest site. The idea is, that if you need a logo, a book jacket or whatever visual design created - you pay a small fee to set up a contest, define your parameters (i.e. A online business selling handmade jewelry that appeals to women over 30 who like big statement jewelry - need logo for website and letterhead/business card) - or whatever - set a "prize" - a fee for the winner - and let 'er rip. Designers submit their designs, and you pick the one you like. Browsing the site to see what has been submitted is very interesting too. And it's fun to play critic looking at other's designs. Or imagine what you might do instead! Something to think about - if you are planning on launching your own business. A professionally designed logo - could well be worth the price! Wowsers - we had a warm spell there - I thought it was spring. Spring - as in a fountain of water - which is what I get in my backyard when it melts. So - thinking of Summer Thunder - and Oh Look - More of those Summer Thunder beads in other shapes! And Car Lot Flags! There must be a law that says Car Lots have to have lots of whippy little flags. Especially used car lots. Ooops, sorry - pre-owned car lots. Tourmaline (coloured) donuts. Tanzanite Two-Ways. Nuff Said. I've got another "inspiration" post for you today. My inspiration to make anything has been sorely lacking as of late. I've just been so busy over the last few months, that It's been quite difficult to get in any time to make anything. Yesterday's simple little necklace encouraged me to do something slightly more elaborate...but still simple, and it'll take less than an hour to whip up. A single bead, a simple bail, and a chain. Sounds kinda boring right? Not if that bead is a 28mm Swarovski Twist bead. We've had these for a while, but sometimes you need to see something in a new light to appreciate it's beauty. 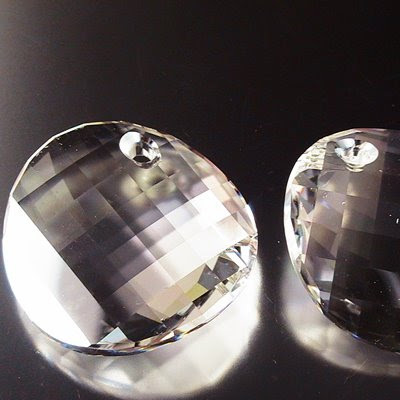 I was restocking the Swarovski wall this morning, and the light must have hit these just the right way. I now have a new necklace, that I whipped up in a about as long as it took me to remove the items from the packages. And one 16 or 18" box chain @ 8.15 (for the 18") - I'm wearing the 18" - If you're thinner, this would like nice higher on the neck. In that case, choose the 16" version. That's it! You now have a new necklace...Or give one to your mom for Valentines day....wait, I guess I don't have a new necklace anymore - Thanks Mom! February is looking hot--not just because Valentine's Day is coming or because the temperature outside has risen, but because of the super hot classes we have coming up this month!! A lot of our February classes are full or just about full. But, do not despair, because there is still room in some of the really interesting classes. This Saturday we have An Introduction to Chinese Knotting with Angela Peace. We only offer this class about once a year. There are only 3 spaces available so I would book now if you are interested. 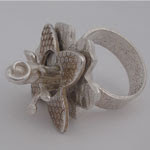 February 21st and and 22nd we have the Intensive Metal Clay weekend with Jennifer and Heather. This is an intermediate level class so you must have taken and introductory class like Charmed I'm Sure. This is going to be an awesome class! Looking for a quick introduction to glass bead making, Amy Waldman-Smith is offering a one day, 5 hour introduction class on the 22nd of February. There is one space remaining in Nadine Foskin's Basic Bead Stringing on February 26th. And don't forget about Nadine's Dancing Dahlia's Brooch on Saturday February 28th. If you are looking for a springy activity or want to put yourself in the spring kinda mood this is the class for you! I am hoping later this week to blog a bit about my trip to the Dominican Republic, but if not blog you next week! Ha - we have two!!! Two!! inspirations coming up on Wed - because we have TWO!!! Celebrity Guest Inspiration Designers! Dueling Inspirations, if you will. If you want to be a celebrity guest inspiration designer - please send your wheedling emails and bribes to me! You'll just have to wait till Wednesday to see what they are. Marg our buyer has been in Tucson for the last week. While she was gone, I took over the inventory (along with lots of help! ), and restocking. Or at least attempted to without making too much of a mess of things. Marg is highly efficient at what she does. She seems to know the wholesale price of almost every sku we carry off the top of her head. She can keep our weekly shopping within budget effortlessly. Marg, welcome back, and thank you! In other news, a reminder that we're hosting our special Valentines Day open beading session this Saturday, February 14th. Join us from noon to 3pm, with a project to work on...and cupcakes to share! By now, your buggy bouquet should be looking nice and full and flourishing. The back should look like a dog's breakfast. Worry not! Twist all the loose wires together on the back. Trim them - not too short. You need for the tension to stay on the wire, but short enough to give you room to add the back plate. Fit the back into position. Make sure it is oriented so that the pin back is the right way up, - doesn't sit upside down when you wear it - and that the prongs can all fold down without hanging up on a leaf. You may need to jiggle it around a bit, turn it a smidge, to accomplish this. Fold down the prongs with a thin nosed pair of pliers. et Voila! Wear and enjoy! And - if you like making these, but have run out of coats to put them on - try getting a plain back (not a pin back) and glue a sturdy magnet on the back, and dress up your fridge! Next, we'll add the focal flowers. 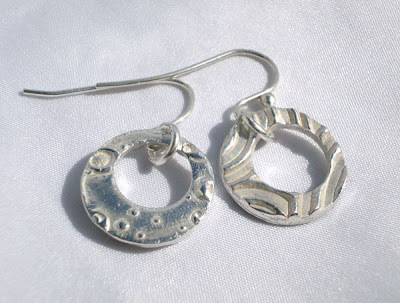 Because these are flattish with a central hole - the are tough to wire on directly. Poke the wire up through the screen, and through the flower bead, and then through a smaller bead (in this case, an aqua bicone) and back through the centre of the flower. You can go through the same hole or a different one in the screen. At this point - it is getting busy back there - so you may have to go for whatever hole you can get it through. For the next two flowers - I wanted more depth, more dimensionality. So I took one of the glass, flat flower beads, and put it underneath the focal flower assembly - threading on a "lifter" flower, then the focal flower, then the stopper, and back down through the two flower beads and into the screen. This bead is almost invisible, except from the side, and serves only to lift the focal flower up and make the whole thing more dimensional. It would have been nice if it had added to the design, but it worked fine the way it was. Next, we are going to make a spray of leaves with a lady bug on them. This will be added to the brooch as a single, dimensional element. Start with the lady bug and a fresh piece of wire, about 6 inches. Thread Ms. Ladybug onto the wire, move her to the centre and fold the wire in half. Hold the wire in your right hand, and grasp the ladybug firmly in your left forefinger and thumb and twist 2-3 times. The wire will twist at the ladybug bead. Separate the ends of the wire and add a leaf on one wire, leaving a half inch of wire from the ladybug. Grasp the leave in your left hand and twist. The wire will twist up to the lady bug. Bend the wire so that the leaf is next to the lady bug, and take another end of the wire, add a leaf, and twist to secure in place. You can add a flower bead, more leaves, etc. Don't go crazy twisting the wire, just a few twists, as the wire will fatigue and break if you over-do it. Poke the spray of leaves in amongst the other leaves, and poke the two ends of the wire in through separate holes, and twist on the other side. Make another "spray" or two, and add where the "bouquet looks less full. Next - Part 3 - finishing off. CreativeFX Yearly Voting Now Open! Canadian Premiere - Handmade Nation!